What happens to Bitcoin if the stock market crashes? Many on the internet have speculated as to whether a major crash in the stock market would send Bitcoin to new heights or drag it down with it. There are a couple of different viewpoints on this, much hinging on whether A) Bitcoin and the stock market are correlated, and B) Investors see crypto as a high risk or low risk investment. Ultimately, the correct answer is nobody actually knows, because cryptocurrency has only ever existed during a bull market for Wall Street. Seeing as that may be changing with the stock market beginning to show signs of a downturn, we may soon find out exactly how this unfolds. 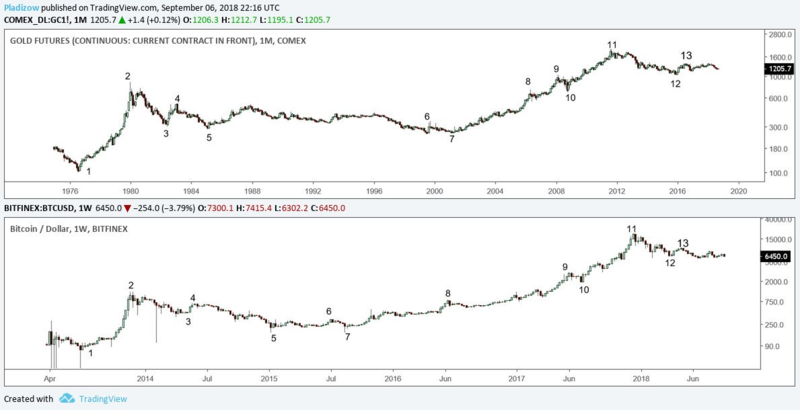 First question, are stocks and Bitcoin correlated? The implications of this answer are what will likely decide how Bitcoin responds to a stock market crash. The case for Bitcoin being a safe haven comes more often from those who believe in the crypto community and who think, on average, crypto only has up to go. Often you hear people cite the term “digital gold,” when referring to Bitcoin, and there are some reasons to see parallels. Watch: Will Bitcoin flip gold and reach $500,000? "Despite the rise and fall of various altcoins and fork considerations, ’time’ works FOR Bitcoin, not AGAINST it. Every day it doesn’t disappear, it gets one step closer to a permanent status of digital gold." So Queen Mathematics again show her power. $btc is 24/7 market (168h/ week) Stock is 8/5 market (40h/ week) that is 4,2x faster. Now look - 43y/9y is 4,7x. Not $btc will follow stocks, #stocks will follow #crypto. Patience. Lastly, it was observed recently that Bitcoin has been increasingly correlated with gold as we head into 2019, possibly implying that this is how investors are coming to feel about it. So if Bitcoin is like gold, is this good? Potentially. There is a great explanation on the pro's and con's of gold as an investment by The Motley Fool, which points out that gold can be very safe as part of a well balanced portfolio, but is fairly volatile and can be risky as a lone investment. If investors see the same value in Bitcoin, then it is plausible the digital currency will expand its presence in institutional portfolios and this should help to drive up the price, but it also leaves a vulnerability: both Bitcoin and gold, even if correlated to each other, are seemingly not correlated to the market. They are still relatively high risk on their own, and when things go bad, investors often pull money out of their riskier assets first. This leaves us with the unfortunate possibility that if the stock market tanks, investors will want most of their money in the safest of places, and realistically that isn't Bitcoin (though cases could be made for certain altcoins and stablecoins, it is outside the scope of this article). If this is just speculation, does it matter? This has been a 10 year bull run, which puts it among the longest bull runs in history. One thing we know about these periods of growth is that they always, inevitably, end. Now looking at that chart, we can see we have formed a double top on the weekly over the last year. Generally, double tops are considered bearish signals and combined with the downside action we have seen in recent days, the technicals don't look great. Next we have the fact that the Federal Reserve recently raised interest rates and expects to do so again soon. Don't let the line that it is due to the “health of the economy” blind you, as historically interest rates begin to rise before a large crash. One more concern is that the U.S. trade war with China is poised to hurt quite a few major companies, and has already done so with Apple. The market could definitely see a rebound and we could have months or years of growth before any major downturn. It's simply pointing out that the bull run has to end someday, and at the least current signs are worrisome. Do your homework, invest in what you believe in, and never with more money than you are prepared to lose. That is a strategy that should at least keep you out of the poor-house. Watch: What do non-crypto holders think of Bitcoin? Do you think when stocks have a major crash Bitcoin will go up or down?